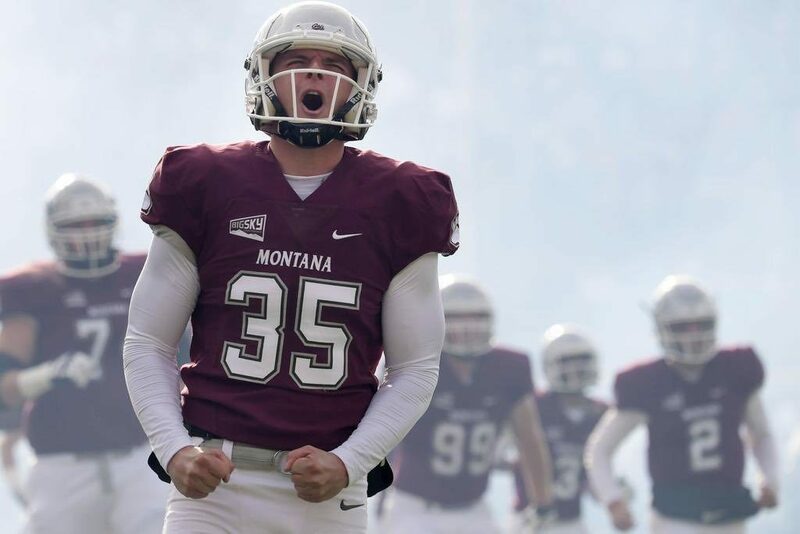 Eric Williams the punter from Montana has a monstrous leg, and I am a huge fan of his. • Growing up in Missoula was special because of the role the University plays in the community. Everyone supports the academic programs, and they especially back the athletic teams. Being able to watch the football team during my childhood and then become a part of it with my home town at my back was an experience I’ll always treasure. • Strength and Conditioning, Practice, Film Study. You can’t practice if your body isn’t in good enough shape to perform, and you can’t watch film of practice if you haven’t done the field work yet. You shouldn’t re-start that cycle until you’ve broken down the film. They truly play an integral role in the others. • I worry about not being prepared enough on game days. That’s one of the things that drives me to train and work, especially on the days when you need a little extra kick. • My Freshman year in high school, I was placed on the second tier travel club soccer team. I managed to find every excuse why the coach didn’t like me or I didn’t get a fair shake, but eventually I realized I just wasn’t prepared enough and didn’t perform how I needed to. I vowed to never let myself meet a challenge again without complete preparation and the mental confidence to know I was ready to perform my best. • I think my teammates appreciate my everyday consistency the most. I try to be consistent in my effort, my passion, my work ethic, my leadership, and my performance in every aspect of my life, team oriented or not, and hopefully that shows through to them. • Probably either Dante Pettis when he was at UW or Cooper Kupp at EWU. Both were incredible in their collegiate careers and at the next level as well. • I plan on going into Equity Research at a large bank like Goldman Sachs or JP Morgan. Through my internships I’ve found I have a real cognitive passion for that field and I hope to pursue it after football. • My room first, because that’s where I begin and end every day. Then my car, because my mode of transport being clean and proper keeps my mind clear before activities. My desk last; my thought process can be tangential at times and leads to a cluttered work space. • One family member; hopefully their family members would be afforded the same choice and made the same decision, leaving no one left in a perilous situation. • Danny in Caddyshack. Although sometimes youthfully misguided at times, he’s got a good heart and works diligently to achieve his goals. • Growing up i loved football and wanted to play it collegiately but was never big, strong, or fast enough so I chose to pursue soccer. In high school I suffered a bad leg injury skiing that took nearly a full year to recover from. I wasn’t able to play soccer that fall and had to switch back to kicking footballs. That adversity of having to switch away from my goal turned out to be a massive blessing in disguise. • My sophomore year we were playing at Cal Poly and I played through a full-on case of influenza. I hit a punt and stumbled backwards and fell right on my back. Luckily it was a fair catch but the film was very embarrassing. • Probably when Dante Pettis returned a punt for a touchdown against us to tie the PAC-12 record. It was heavily covered by the media and I still get comments about it regularly. • Scholarships by Drake and Future. My best friend and I listened to it every morning at 5AM when we were tryout walk ons trying to make the Montana football team. • An inherent trust in your preparation. It allows your mind to be clear on game day and lets you play to your full potential. • Abraham Lincoln. It’s a cliche answer but he’s a true American success story and he overcame a lot in his life to become one of our nations greatest leaders. • I always loved how Danny Amendola played. He was gritty and tough, not overly flashy and did everything he could to help the team. Never got a lot of love or respect publicly. • Respected. People can form their own opinions of who they like or don’t like but to a greater extent you can control others respect for you based on your actions and your character. • I don’t know if feel for is the right term but I’ve always respected the way Ryan Leaf turned his life around after throwing away what many people considered to be a very promising NFL career. • I hate to lose. I had a coach tell me once that everyone loves to win, but the people who are the most successful are driven by an intrinsic fear of losing, and use that fear to help them prepare and compete on a daily basis. •My parents for sure. They’ve instilled all of the qualities in me that have made me successful thus far and I owe everything I have to them.